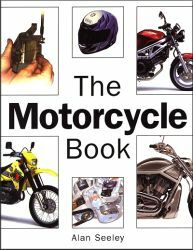 The Motorcycle Book provides a comprehensive reference source for all motorcycle owners and enthusiasts. From scooters to sportbikes, through touring rigs and commuter bikes, all aspects of buying, riding and maintaining a motorcycle are included. Whether you're a beginner or an experienced rider, you'll find all the details you need to help you select the right machine and get you up on two wheels. Detailed sections on how your bike works and how to keep it running, along with extensive maintenance and trouble-shooting chapters will ensure that you and your bike stay on the road. Author Alan Seeley is a long-established motorcycle expert and is currently editor of Performance Bikes magazine. Chapter 1. Which Motorcycle? Sportbikes. Sport tourers. Tourers. Standards. Retros. Cruisers. Dual Sports. Adventure tourers. Supermotos. Commuters. Starter bikes. Classic Bikes. Scooters. Mopeds. Chapter 2. Getting on the Road. Starting out. Basic training. The knowledge test. Advanced training. Trackdays & race schools. Helmets. Leathers. Fabric jackets & pants. Gloves. Boots. Rain gear. Armor. Insurance. Security. Luggage. Gadgets. Chapter 3. Know Your Motorcycle. Tires. Buying, choosing & fitting tires. Engine types. Engine layout. Transmission. Tuning four-strokes. Carburetors. Carburetor tuning. Fuel injection systems. Exhaust systems. Race/performance exhausts. ECUs and ignition. Frame types. Suspension. Swingarms. Wheels. Brakes. Chassis accessories. Chapter 4. Looking After Your Motorcycle. Tools & maintenance. Cleaning. Chain care. Brakes. Cables. Oil and filter change. Cooling systems. Bearings. Electrical. Buying used. Storage. Is your bike legal? Trouble-shooting. Glossary.